When working in the property market you will be expected to keep good records of any business transactions you undertake or any dialogue or written agreements you or your clients enter into. Property issues are some of the most disputed in the country so it is important to keep a record of every meeting and every client you meet, you should learn good record keeping skills on day one of your career in property. Keeping records does not have to be a long and time consuming job it is all about good organisation. You should create a file for each client that you meet, even if you meet them for thirty minutes and do not expect to see them again. If you want a career in the residential property market as an estate agent then you are likely to have a number of clients that are landlords. You will need to keep track of which tenants are in their property and all the particulars about rent, bills and any maintenance work that has been done to the property. You will also need to make sure you have adequate records of when any deposits that were paid and what money was exchanged. It will not be the responsibility of the landlord to do this but left up to you. 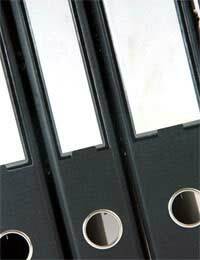 If you choose a career in commercial property the need to keep good records will be even greater. You will need to make a note of every piece of dialogue between you and your client and keep a photocopy of any agreements that are entered into. The property market is no stranger to legal disputes when it comes to who paid what for a property and what both parties agreed to.You may find yourself having to go to court for your client and dispute a case regarding one of their properties, you wouldn't want your property career to come to an end because you failed to keep good records. You will need to keep client records for all types of reasons, a client may need to prove how much tax they earned or you may need to prove how much commission you got from a case. Even if you have only had a couple of meetings with a client it is worth keeping a record of the meeting and their contact details, it may have been that you could not help them on that occasion but you may be able to help them in the future if another property crops up that they would be better suited to. There is no set rule on how long you should keep a person’s records, for tax purposes you should keep a person’s file for at least three years, this also applies to most legal issues. If you can though you should try and keep a person’s details on record for as long as possible. It can be hard trying to find enough storage places for clients’ records and you could find yourself snowed under by mountains of files but you should try hard to not throw anything away. Record keeping is becoming a lot easier because of the ability to store things electronically. You will have to be careful to make sure you have everything backed up so if you lose your computer you will not lose all of your files.Storing things electronically is a good idea but if there are any legal questions over a property transaction then the chances are the lawyers will want to see the original documents. When starting your career in property you should make sure that from day one you keep a record of every meeting you have and every client you see, this will solve a lot of problems in the future and make sure your employers are legally covered.